Klipschorns! These things are huge! I’ll write a more in-depth post soon but had to share. I’m very excited! I just picked up a pair of slightly-battered Celestion SL 6sis. My initial impressions were very positive – they have a detailed and pleasing sound, very accurate and with great separation. 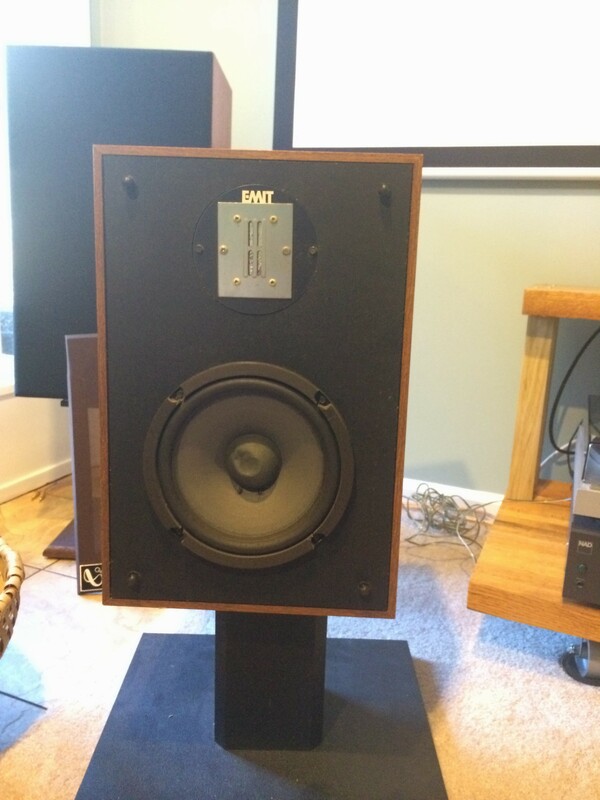 I’m currently using a pair of slightly-battered B&W DM601s in my bedroom and recently purchased a pair of Paradigm Atom v4s for installation as my rear surrounds in my basement HT system. It was high time for a shootout! The conditions for the competition were as follows: my NAD Monitor 7100 receiver would be the power source, fed by my Apple iPod Classic 160GB and my Sony Blu-Ray player feeding into the NAD. 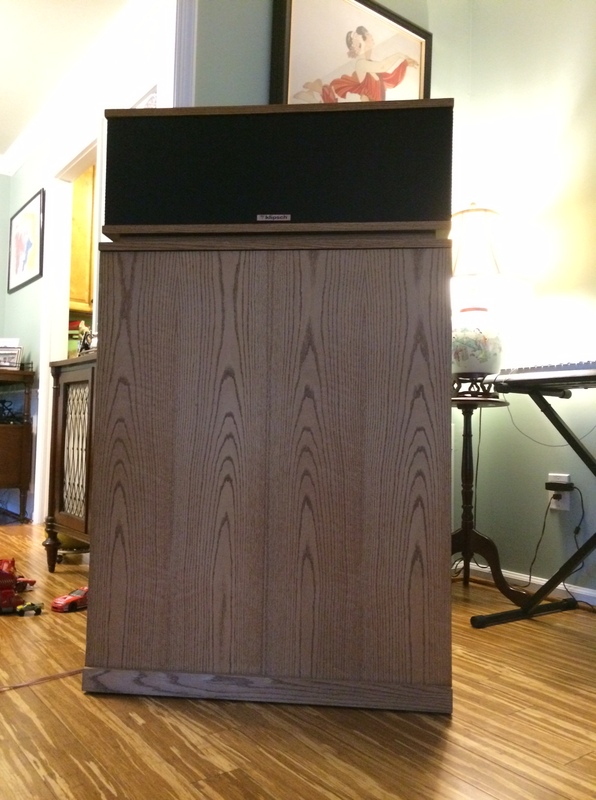 All three pairs of speakers would run without subwoofer and mounted on the Celestion 24″ stands I picked up with the SL6s. First up were the Celestions. 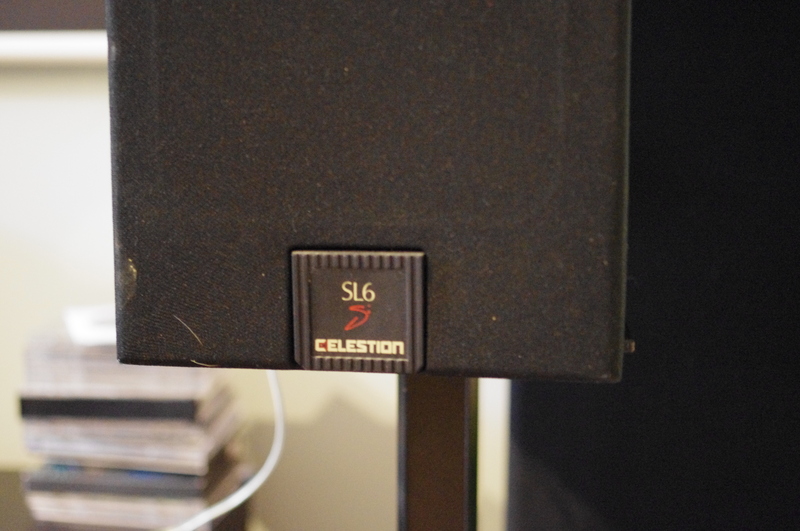 The SL 6si was a later incarnation of the original Celestion SL6, released in the early 1980s. The SL6 was lauded as the first metal-dome tweeter. The first tweeter was rendered in copper, and both the tweeter and bass unit were said to have been designed using laser-based vibration analysis to determine the real breakup frequencies of the driver. Celestion said that prior to that, most speaker tweeters were suffering from considerable (and unreported) breakup within the audible frequency range. The heavy copper tweeter was said to resist any breakup up into 20Khz. The drawback to the revolutionary design was a very inefficient speaker, around 84 db/watt, which required serious current and watts to drive. While impressive in performance and sound, it was a qualified speaker. Celestion modified the design with the later SL6 si, which replaced the copper-dome tweeter with an aluminum one, an improved crossover and woofer surrounds. This reportedly improved the efficiency and response of the speaker, without sacrificing its famous clarity and imaging. 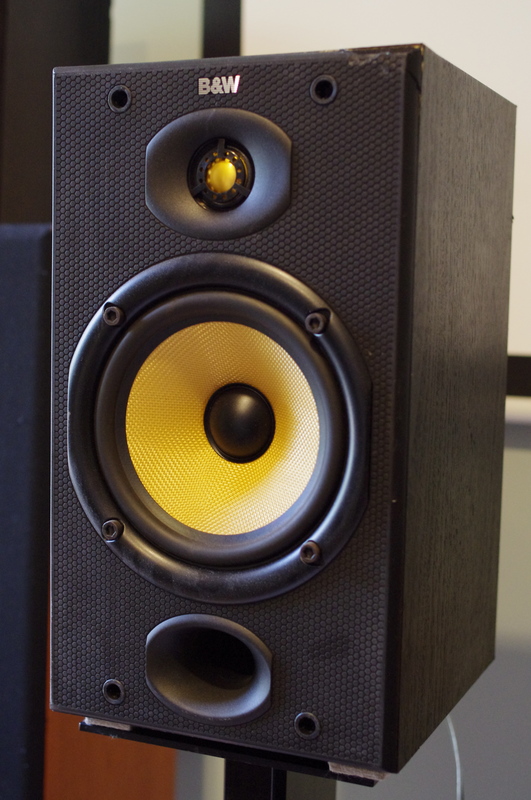 Placed on its stands, the SL6 si is heavy for a small bookshelf speaker – I estimate about 15lb apiece. They easily dwarf the lighter B&W and Paradigm speakers onhand. I like the treble and vocals on Magic Man, the imaging test that Stairway and Pink Floyd present, and I can easily spot what jumps out using all 3 recordings. The Celestions were very impressive. The soundstage they cast was wide. On all songs they presented a pleasant and accurate sound, with nothing jumping out. On Stairway, Robert Plant’s voice sounded realistic and in the room – on some speakers the reverb gets too high and it sounds artificial. Imaging was excellent, and treble details popped out. Detail of Celestion SL6 si front baffle. Note inverted woofer center cone- also laser designed! The most impressive characteristic of the speaker was the air and separation it gave to instruments. Everything was there but space between instruments and vocals was retained. The B&W DM601s had a different flavor. The 601s I have are a little cosmetically beat up but functionally immaculate. These 601s are the Series 1 and the first iteration of the long-lasting line of this entry-level two-way from B&W. In the past I’ve been really impressed with their honesty and performance, in particular when I had them hooked up to a Denon 1907. Hoisted up on to the Celestion stands after the SL6s, however I was shocked. I started with ‘Wish You Were Here”. The midrange at first on the guitar intro sounded warmer, and the soundstage was elevated more vertically. But once the whole band kicked in I noticed right away that the tweeter didn’t kick as high with the same clarity of the Celestion. And then when the cymbals came on I started to wince – this was getting harsh! I actually turned the recording off halfway through the song because the tweeter was so harsh it was uncomfortable. Astonishingly, I’ve never encountered that in these B&Ws before, but I must admit they lead a very relaxed life as my bedroom TV speakers and never have to work too hard. Overall the B&Ws had the bass and a warm midrange but shocked me with harshness in the tweeters and less range than the Celestions. Off the stands they went. B&W DM601s. My pair is a little dented in the upper corner. But this has no influence on the sound, which in this test, was disappointing. The Paradigms were last. They’re tiny and featherlight compared to the Celestions or even the B&Ws but I didn’t let that cloud my judgement. When the songs started I was pleasantly surprised. These have a great soundstage, good bass (you need to turn it up a bit), and very nice highs. They are very very pleasant to listen to. Overall they feel noticeably ‘softer’ than the Celestions or the B&Ws but not in a bad way – they impart a different character to the music but it’s fine. I was really impressed with the Paradigms and came away convinced that they are really nice. It’s almost a shame to put them on the walls in the back of my HT. Last of all I put the Celestions back on the stands for a final listen. Once again they just sounded ‘right’ where the others fell short. I could listen to these for hours. And I’m looking forward to pairing them with my B&W sub to see how they sound with the low-end responsibility delegated somewhere else. I picked these up off of the local Craigslist at a very nice price. My intention is to hang them in my basement and use them as my rear surround speakers for the HT. I don’t know much about Paradigm, other than that they make a long line of nice speakers that start at very reasonable prices and get quite expensive. There are lots of them on my local Craigslist and some are quite pricey. The Atoms here are one of their smallest models. They are maybe 11″ tall and 7″ wide and weigh less than 5lb each. They have MDF enclosures with a black ash finish (vinyl or veneer, can’t tell) with a molded plastic back and non-removable cloth grilles on the front which hide a tweeter and 5.25″ woofer. I think new they cost about $200/pair retail. I also read that after the V4s the V5s became part of the ‘monitor’ series and were EQ’d differently, with a cutoff around 80hz with the expectation that they would be tied in to a subwoofer. I guess that these go down to about 50hz, though while the enclosure is rear-ported the speaker’s small size means that there’s not likely much juice down that low. When I originally demo’d them through the Yamaha CA-1010 I’m playing with that assessment held – good sound but missing that lower octave. The bass that’s there, mid- and upper bass, is good and well-resolved. I really couldn’t tell that much in my short initial demo. A couple days later I perched them on top of my modified Polk Monitor 7Bs and did some A/B tests through my Pioneer VSX-823K, along with my B&W ASW600 sub. Pairing the Paradigms with the sub, I thought, would allow them to focus on their strengths and me to determine how they performed in my typical 2.1 setup. On top of the Polks and a few inches from the wall may not be the ideal placement for the Paradigms but they did a good job. Integrated with the sub, they provided a pretty seamless sound spectrum. There was however a strange resonance or honk in the midbass. I don’t know whether that was from the speakers themselves, the placement, or some resonance from sitting on the Polks. But it was noticeable. Overall however I really liked them. The tweeters shine a little brighter than the Polks’ Peerless, which is not surprising given the Peerless’ laid-back character. Imaging was more precise than the Polks but the soundstage was very similar. I am also experimenting with speaker placement and toe-in which heavily influences these things so my impressions are not totally definitive, but I can say that the Paradigms, despite their small size, filled my room with very good sound and didn’t give up much to the Polks, which are much bigger and carry a lot more ammunition in the form of a massive 10″ passive radiator. The Paradigms will serve excellently as my rear surrounds. I’m actually a tiny bit sad that I’m going to hang them back there and not really enjoy them to their full potential – they have a lot to give. They are also piquing my interest in trying more small-size monitors for my front surrounds and 2-channel music listening – I continue to be impressed with the accuracy and quality of modern smaller 2-way speakers, and I feel that a good and well-integrated sub negates the need for full-range speakers, at least for my purposes. 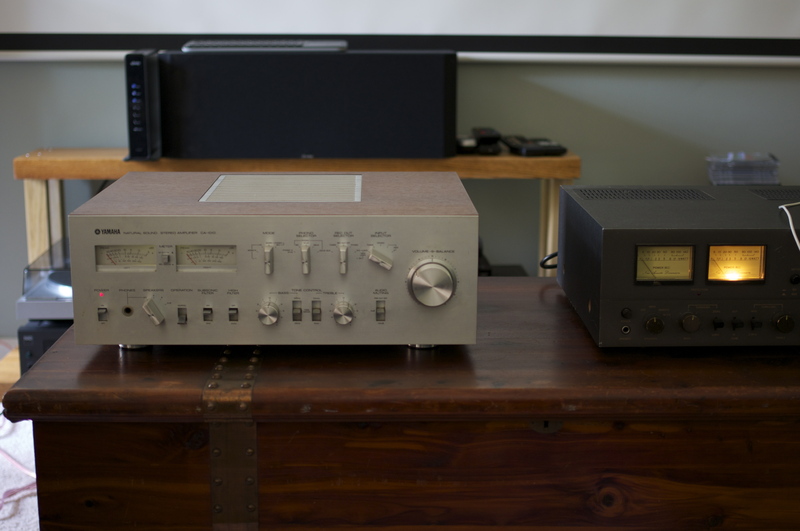 I finally got around to some extended listening of the two new integrated amplifiers in my stable: the Yamaha CA-1010 and NAD-3080. It was quite interesting. I lined them up and flipped them on to warm up. Both are beautiful units in their own way – the Yamaha is a silver beast, a modern take on the 1970s brushed-steel stereo aesthetic. The NAD on the other hand is almost a missing link – its metal face is painted a battleship grey with yellow lettering painted on. 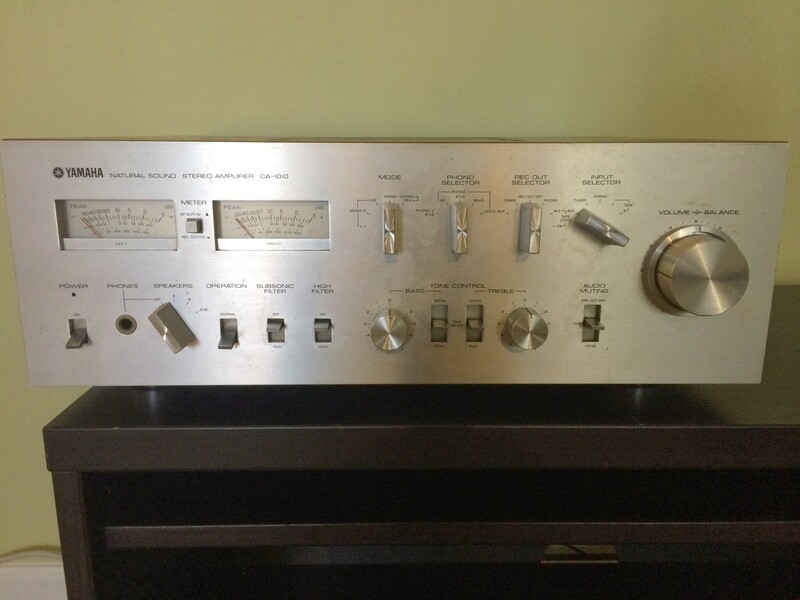 It’s almost halfway between the silver metal 1970s units and the black plastic stereos that would become prevalent in the 1980s. It’s also different from subsequent NAD units, which would come in a different grey color with white lettering of a different typeface. Very interesting. The NAD is rated at 90 watts per channel at 8ohms at 0.03% distortion. The dynamic headroom at 8 ohms is high in typical NAD fashion, meaning that the amps dynamic power for peaks jumped to 160 watts for short periods, or 200 watts at 4 or 2 ohms. This thing has plenty of juice. To keep the comparison simple, I used my iPod Classic and a 30 pin connector to RCA cord plugged in to the aux outlet on both amps. I thought these songs had ample opportunity to test vocals, imaging, bass, and treble. I was right. The NAD emphasized some of the qualities that I’ve come to know in models later in the line that I have already demoed, in particular the 7240PE and the 7100 Monitor series. The NAD has a clean sound with a good bottom end. In my mind, either due to the amp’s age or late 1970s vintage status, I thought that it had a bit of that ‘vintage’ sound – there was a pronounced bass and low end (plenty of power there) and a tiny bit rolled off top end. The amp itself stayed cool while playing into my Polk Monitor 7Bs. On all songs, and with ‘Royals’ in particular, the NAD was fun to listen to – I didn’t analyze the songs as much as I sat back and enjoyed them. I also kept the tone controls out of the signal path, but the NAD has bass and treble controls with separate crossover switches to allow you to dial in more or less bass and treble at four spots in the spectrum. It was fun to watch the meters jump with the music. Since I sit pretty close to the Polks (about 7 feet away from each) and they are reasonably efficient, I had the NAD’s meters set to the lower position to see more activity. You can push a button that changes how the meters read the power current to make things look more interesting. Otherwise I wouldn’t have barely rated moving the dials on this powerful amp at my listening levels. The Yamaha is a beautiful beast. It’s about the same size as the NAD, a bit taller and narrower. It’s equally heavy, ad 40+ pounds. The specs match up with the NAD, with the Yamaha running about 100w/channel at 8 ohms and 120 watts at 4 ohms. Most interestingly, the amp allows you the option of running at a more efficient class AB amp for full power, or a class A output at 20 watts per channel. Class A operation basically has the amp running full power at all times, heating it up but creating a better sound. I kept it in the Class A mode since I never pushed the amp much further than 5 watts per channel. Speaking of which, if you’re running relatively efficient speakers, wattage dials really help you understand how much power you’re using at any one time. Sitting 7 feet back from my speakers and with the volume turned up to quite loud for my tastes in my basement room, I never saw the needles jump any higher than maybe 5-10 watts per channel. I guess if maybe I had harder to drive speakers or more room to fill with sound I would need more juice. That said I know that watts aren’t everything in judging a power of an amp, and even at low volumes I have often observed that a powerful amp will show more control and cleanliness in sound going to speakers than a weaker amp. 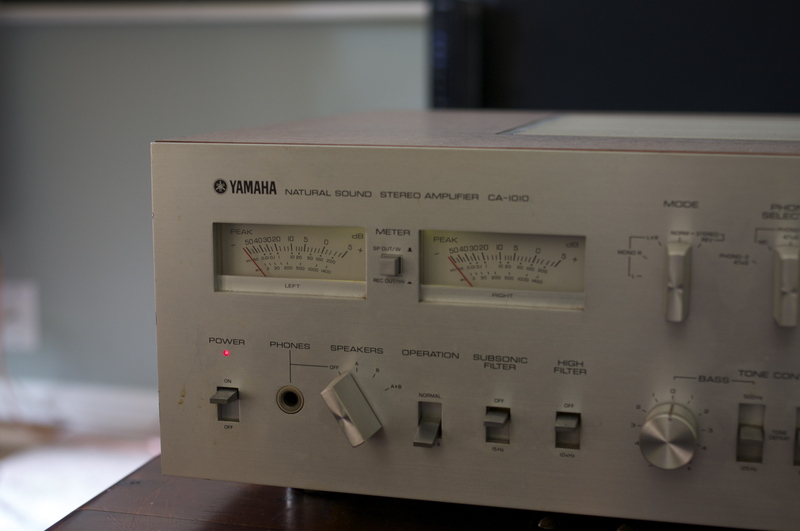 In any case, the Yamaha lived up to its ‘Natural Sound’ name. At least I guess it did. The sound was very clean, and immediately upon comparison with the NAD it sounded uncolored. There was much less bass than the NAD. The frequency reach was there but it didn’t feel as weighty as the NAD at all. And at least in Class A configuration the tone controls didn’t seem to make any change in the sound. I’ll have to try it again in Class AB and see how it changes. 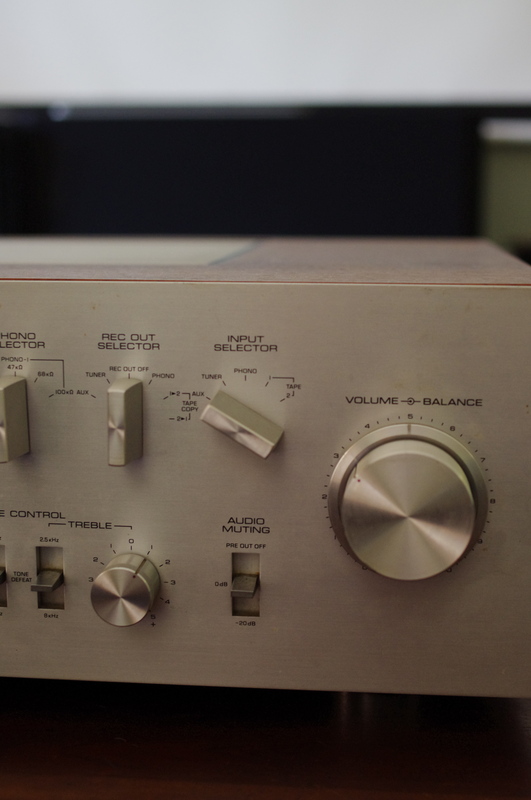 The Yamaha’s precise playback meant it reached a little higher and sparkled a bit more in the top end. The chimes in ‘Magic Man’ lingered a bit longer on the Yamaha than on the NAD. And whereas I rocked more on the NAD listening to ‘Royals’ the Yamaha seemed to uncover rough spots in the recording, or at least in my MP3 version of it – the song sounded less like a fun thumpy pop song and more like a sparsely-mixed march, which was weird. When comparing the two amps I kept wondering whether the perfect mix between the precise top end of the Yamaha and the controlled bass of the 3080 was right behind both of them in the NAD 7100 in my speaker rack. I didn’t get a chance to throw it into the mix. 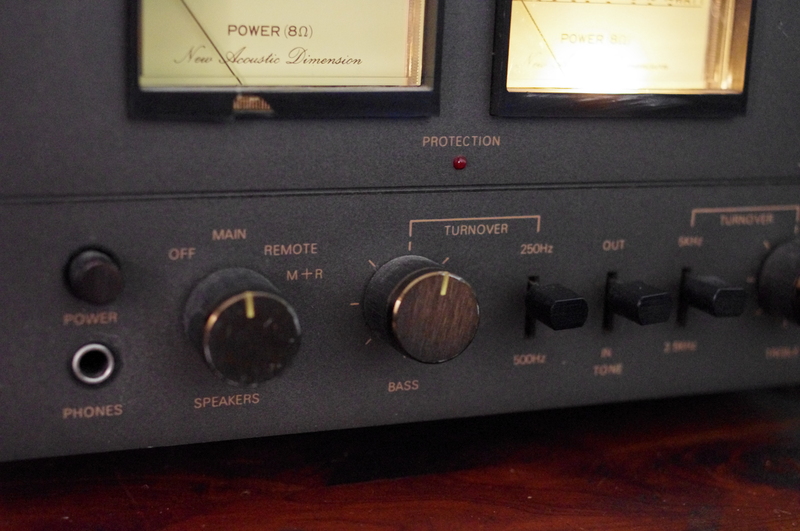 Right now the 7100 is my favorite music-only amp, and until recently was my sole playback source, even for film. Since I got a new Pioneer VSX-823K for my HT duties the NAD 7100 has not been seeing much action, as with the Pioneer’s nice internal DAC, multiple processing modes, and very good sound quality, it’s hard for me to discern any music quality difference that would necessitate me unplugging and re-plugging the speakers from the Pioneer to the NAD. Bottom line is that with the 3080 I love its fun sound and terrific esthetic. To me it feels late 1970’s punk for some reason – when everyone mainstream was disco shiny, here was an upstart with a rough look blowing everyone away with some serious chops. I love that. And I love that it was the beginning of a terrific line of stereos I have all over my house. But right now I don’t have a special place or application that only the 3080 can fulfill. The Yamaha however is still intriguing to me. I see a lot of potential there. I like that the philosophy for its sound diverges considerably from its Pioneer and Marantz contemporaries. I still haven’t gotten everything out of it yet, and so I have more exploring to do. 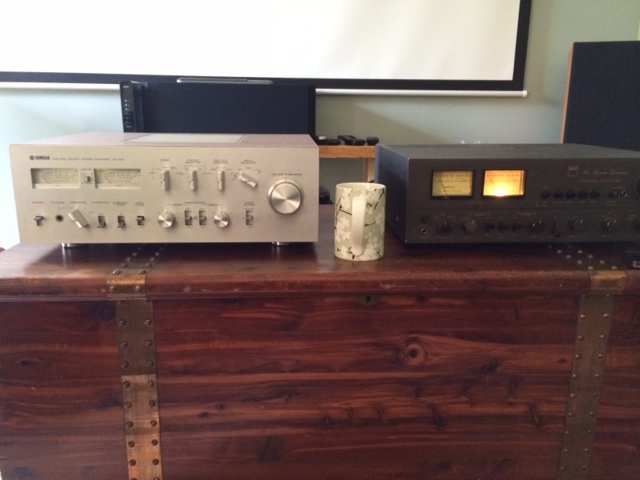 Yamaha CA-1010 and a NAD-3080. 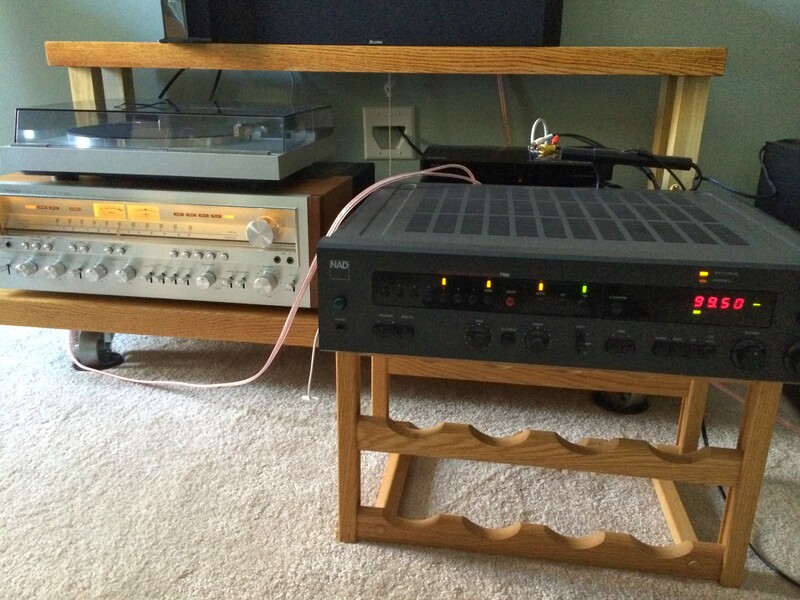 Both date from approximately 1978-79 and put out about 90-100 watts per channel. I’ve tested both and they both seem to work fine, despite warnings from both previous owners that there were problems inside. I’m going to clean them both and run them through a back-to-back test to see how they perform. So far, I played a few songs through the Yamaha and it lives up to its ‘Natural Sound’ name – its clear and uncolored playback made my NAD 7100 seem bass-heavy by comparison. These definitely have two different sounds going on. I’ll be interested to see which one with more testing wins out as more pleasurable to me. 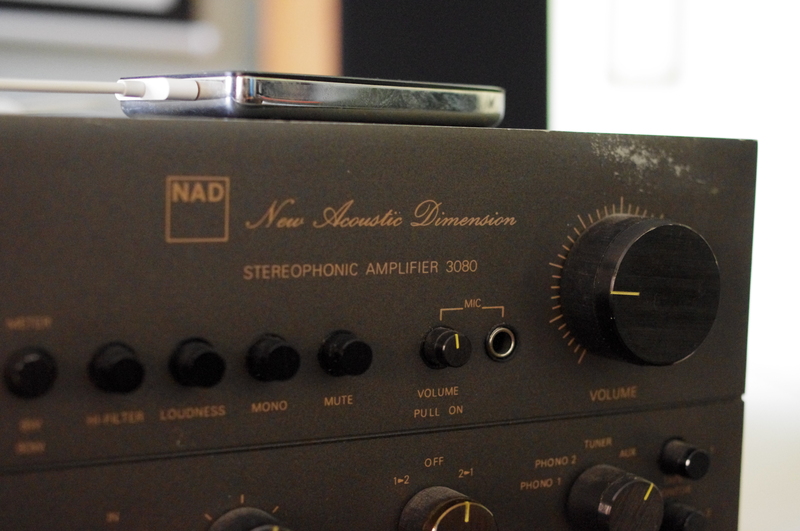 I’ve only tested the NAD 3080 on my workbench, where it made my Design Acoustic PS-10As really thump. No problems there! NAD 3080 Integrated Amplifier. I have the top off to check inside. 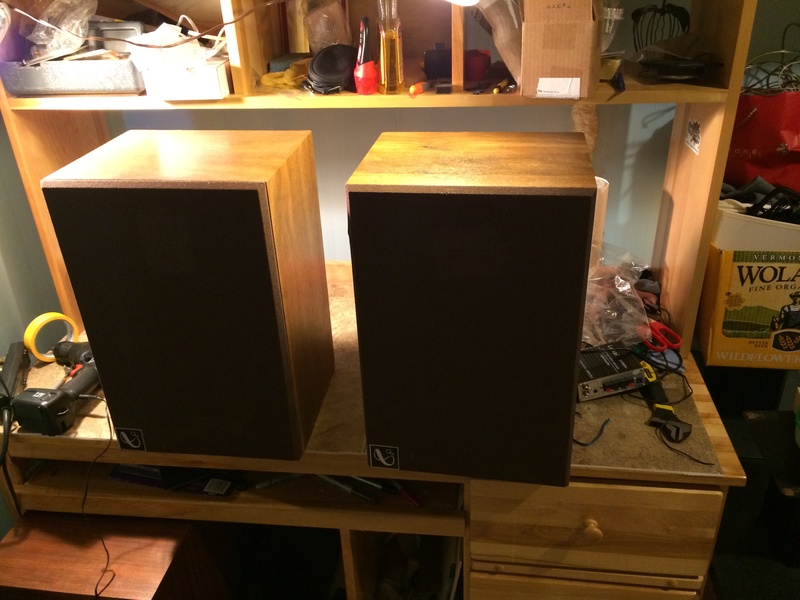 Infinity Qe Speakers on the workbench. These came home with the NAD 7100 receiver that recently bested my Pioneer SX-1250 and made its way into my main listening system. 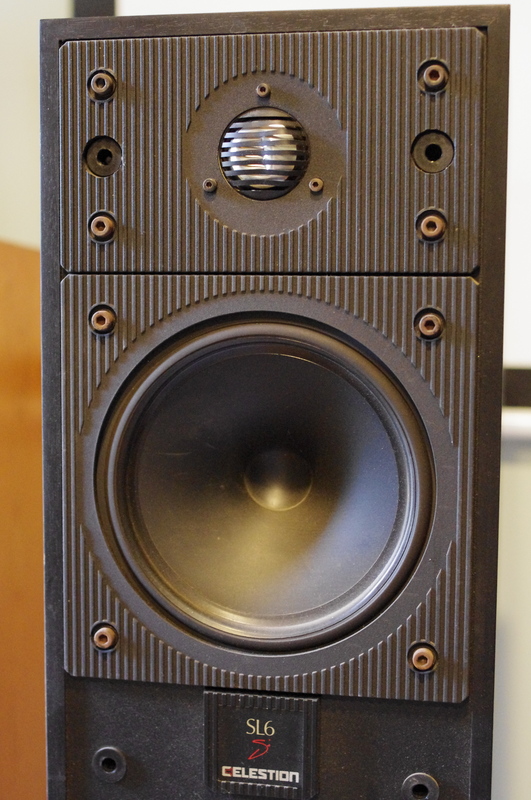 They are a bass reflex two way system from the late 1970s, a little on the big side for a bookshelf speaker at 18 x 12 x 10 inches. They feel light for their size however, and probably weigh less than 20 pounds apiece. The Qes were the entry-level model in the Infinity line of the time, which also released the Qa, Qb, and Quantum line series speakers. All came with a special ribbon tweeter known as the EMIT. 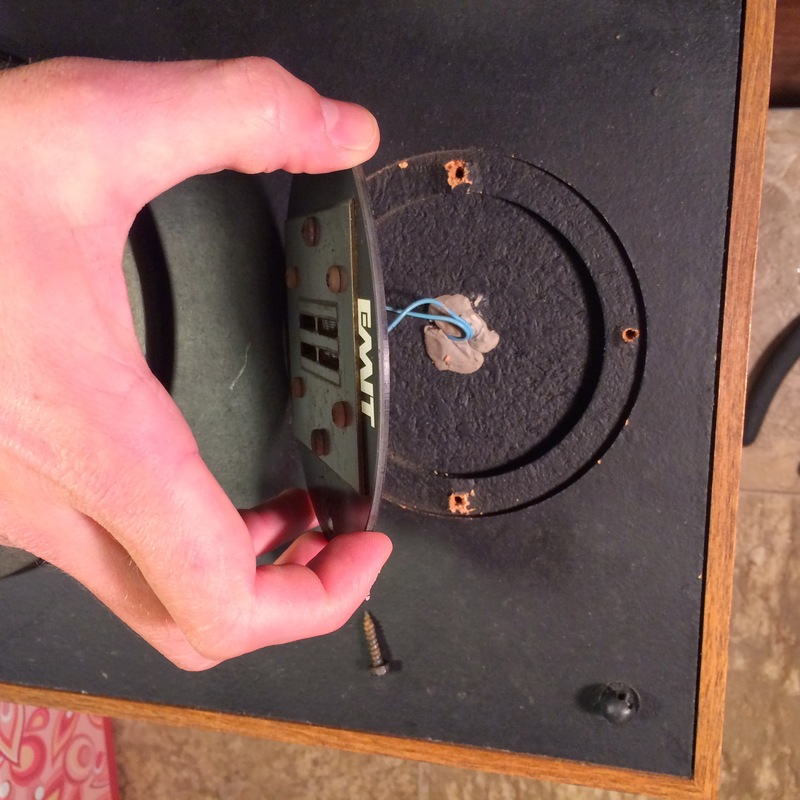 The EMIT tweeters use a plastic membrane as a voice coil between two magnets. The sound is touted as detailed and exact. 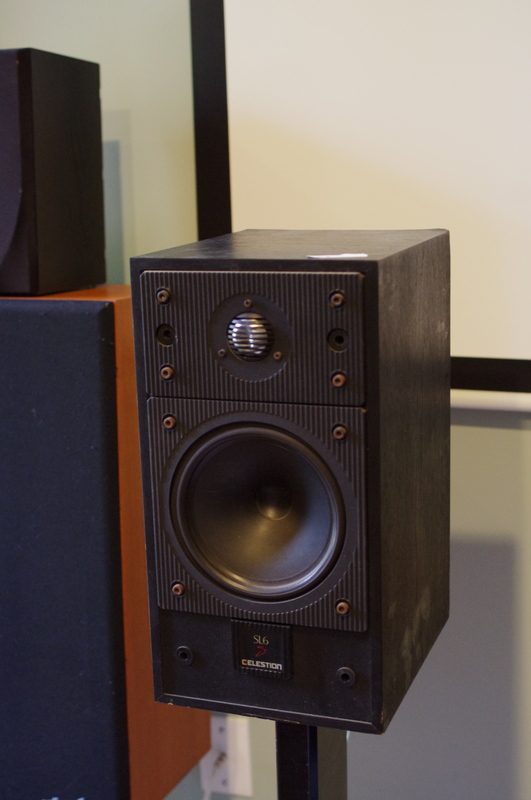 Some folks absolutely love these tweeters ,and Infinity used variations on the design into their later Reference series speakers, which still sell for good money. Close-up of EMIT tweeter in its housing. 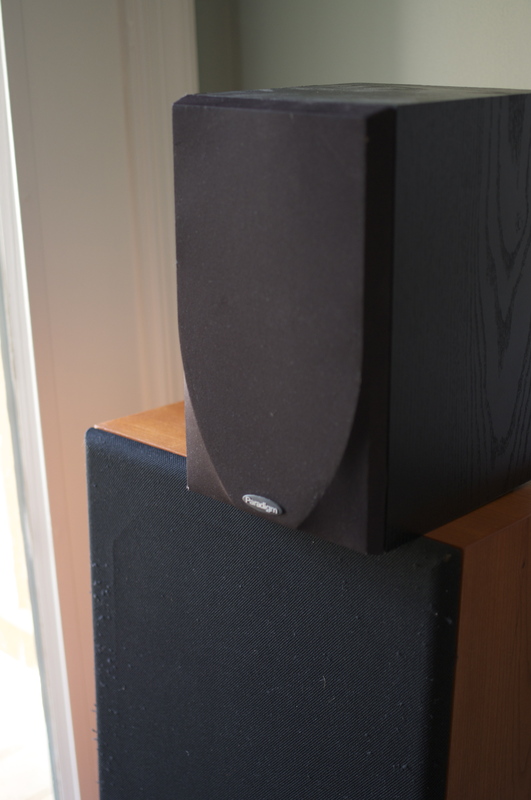 The tweeters can rotate 90 degrees in the cabinet for horizontal speaker placement – the limited vertical dispersion of the tweeter sound makes this a requirement. This example, a two- way with an 8″ woofer, is covered in a luxurious vinyl walnut veneer and come with groovy 1970s brown nylon grilles. Overall the build quality is nothing to write home about, but from a distance they don’t look bad at all. But how do they sound? Infinity Qe on the stand for demo. note the woofer cone on this one is a little dented. The tweeter lives up to its reputation. 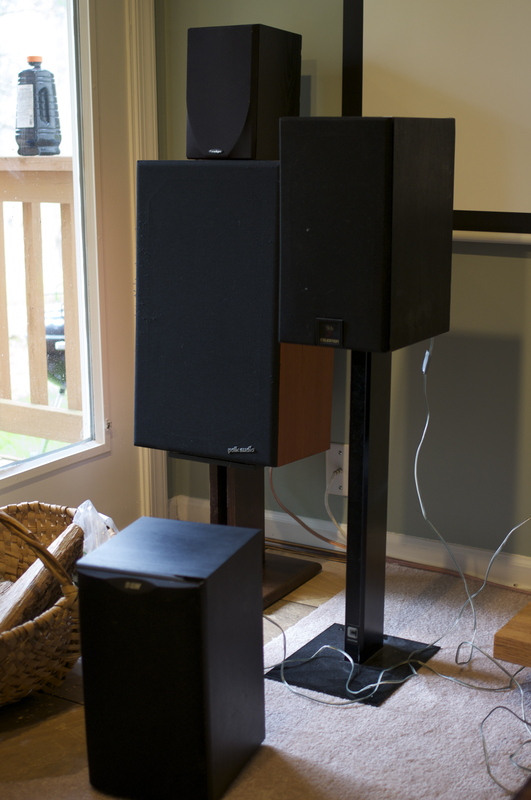 When I set them up for a demo on stands in front of my regular system hooked up to the NAD 7100 it was the tweeters which made themselves known first. They are not shrill or harsh, but detailed. 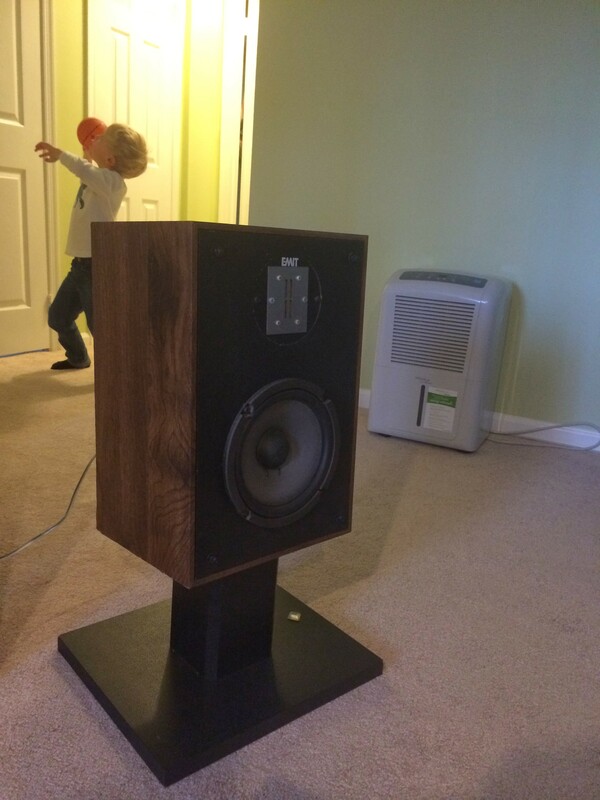 As I had the speakers placed in the room (about 3-4′ from back walls and 8′ from eachother) the treble carried the day, with midrange and low end following. 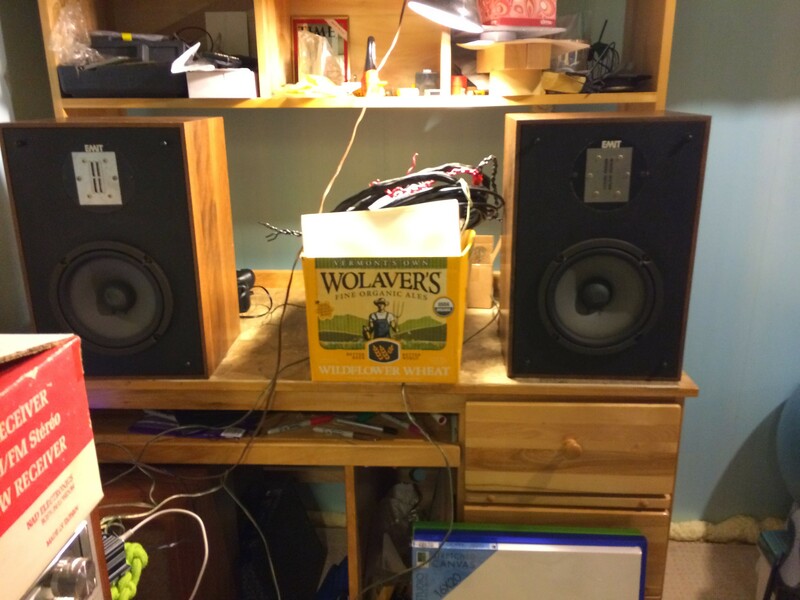 When I gave them more watts and upped the bass control on the amp, things evened out. But I felt that despite the great tweeter, these speakers were getting lost in my bigger basement room. This all changed when I had them hooked up to my Lepai mini-amp on my workshop desk. Closer to the wall and at lower volume, the lost frequencies returned. The sound was full and fun. And the tweeter kept shining. I realized that these speakers really excel as true bookshelves in more-nearfield applications. They weren’t going to fill a big room. But boy did their character change in a small one! The internet is filled with tales of blown tweeter membranes and advice on how not to cook the EMITs (hint: use lots of clean watts, it seems that clipping is the culprit to many a tweeter-murder). I’ll have to keep that in mind as I enjoy these on my workbench with my little Lepai. But so far I am happy. 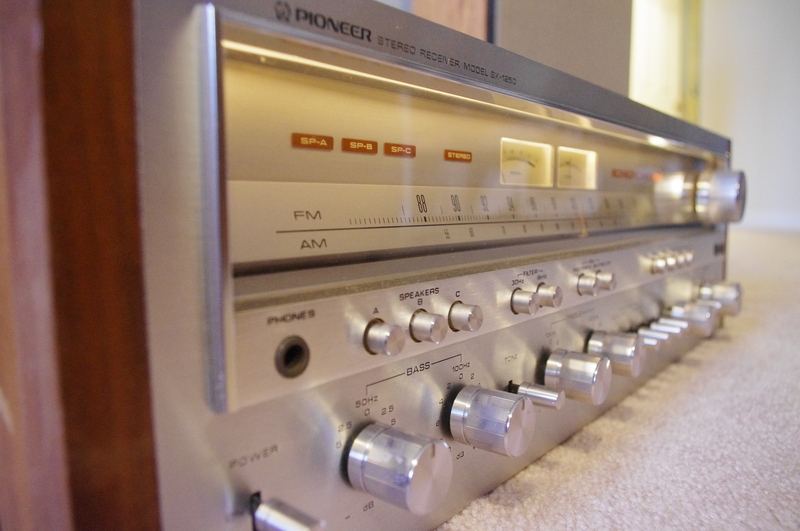 I’ve had my restored Pioneer SX-1250 in my main stereo rig for a while now and I’ve been very happy. 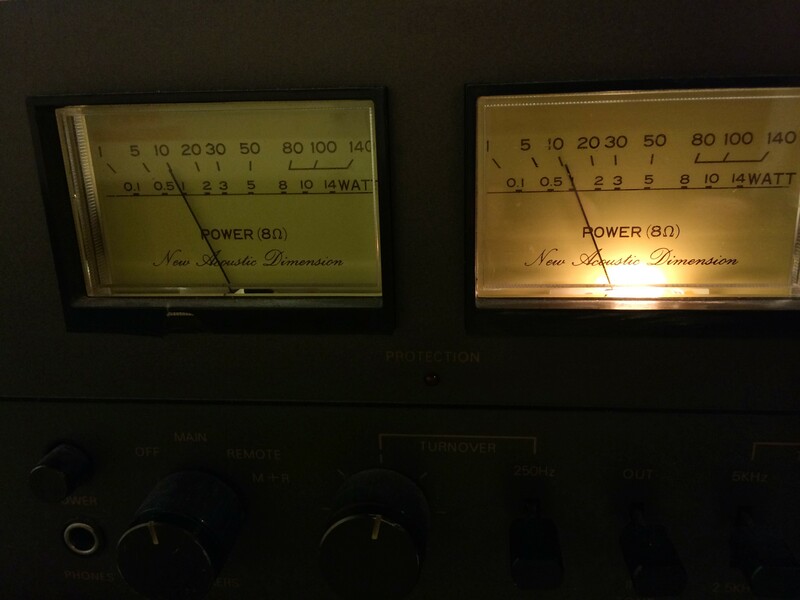 There’s always power to spare and my restored Polk Monitor 7s sound golden. With the massive Pioneer glowing from behind its thick glass and aluminum faceplate the music has never sounded so good. I have my Sony blu-ray player hooked up through the RCA outs for CD duty, a my Yamaha P-500 hooked into Phono 1 and an iPod cable leading into the Tape Monitor 1 leads, accessible by flipping a ‘monitor’ switch on the front of the amp. All very cool and working well. Not long after having everything put together I hooked the Pioneer up to my B&W ASW600 subwoofer. Now I run the Polks via the sub’s crossover, crossing at about 50hz. With the system dialed in the effect is imperceptible but exquisite – a well-integrated sub makes all the difference. Here’s an illustration of that. 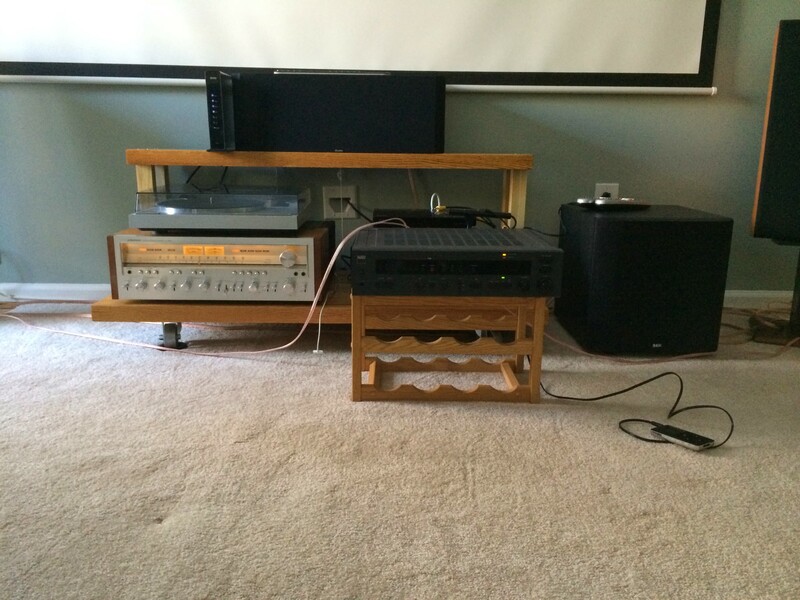 I recently brought home a mint NAD 7100 monitor series receiver and a pair of Infinity Qe speakers. I was eager to test them all, and compare the NAD to my Pioneer. I’d earlier tested the NAD 7240PE against the Pioneer and been very impressed – the NAD had excellent treble and powerful, well-controlled bass and a soundstage wider than the big 1250. All that it lacked was a little of the warmth and glow of the Pioneer. So I bring out the NAD 7100 to test against my Pioneer. 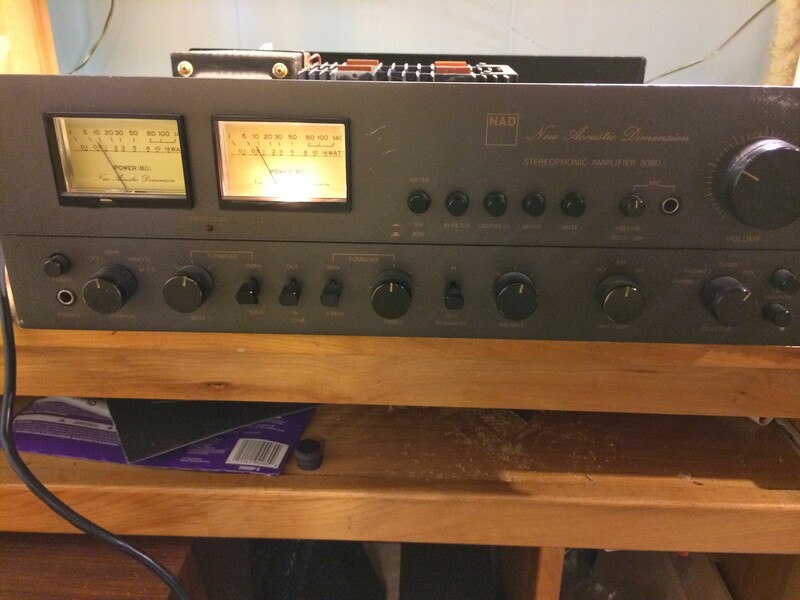 The 7100 receiver is a member of the Monitor series, which came out a generation after the ‘power envelope’ series which my 7240 belongs to. The principles involved were the same however – a basic package housing good components with peak power much higher than the rated RMS watts. In the case of my 7100 (or the 2100 amp or 3100 integrated using the same components) the rated power was 50 watts into 8 ohms, but peak wattage could hit as high as 200 watts into 8 ohms, and up to 330w into 2 ohm loads – very important for correctly portraying crescendos and transients in music. The appearance of the 7100 is close to the earlier 7240 – grey case with a small red LED display, black plastic dials and buttons. But the 7100 comes with a remote, and more of the controls utilize electronic switches which can also be actuate by the remote, in departure from the more basic controls on the 7240. The remote is itself not too pretty but is designed to be able to control a large part of the NAD component family, from preamps and amps to CD players and the like. That’s convenient. I like the look and feel of the 7100 over the 7240PE – it feels a step newer. At first I tried the NAD hooked directly to my Polk Monitor 7s, and then contrasted with my Pioneer pushing the Polks through the B&W subwoofer. Source material was played through the Sony disc player. I told myself I would focus on the music and not the bass, and even turned down the crossover on the B&W after a while to get a clear reading between the two machines. When I tested in that configuration I found the NAD to be exacting and with greater treble but lacking in body. The Pioneer seemed to hit the midrange much more honestly and glowingly. I was quite disappointed in the NAD, actually. I knew it shouldn’t end that easily however. So I unhooked the subwoofer and tried again. Just the Polks for both systems. It was like night and day. Both receivers were much more evenly matched. Now the NAD felt like it had more bass power and control than the big 1250, despite the rated power deficit (The Pioneer is rated at 16ow continuous). Without the presence of the subwoofer coloring the page, the NAD exposed more – the image and soundstage with the 7100 is wide, instruments come out of the darkness. High end (cymbals, transients, and the like) are alive and vivid, not overdone. With the Pioneer, I was missing these things, and always thought that it was the laid-back nature of the Polks’ Peerless tweeter letting me down. Now I knew that was not the case. In comparison with the NAD’s honest and clean soundstage, the Pioneer’s was blurred and compressed. Playing Heart’s ‘Crazy for You’ was a good example – there’s a lot of activity going on behind the vocals and it’s difficult to separate the elements of the chaos into their constituent parts. The NAD did that and stayed musical. The Pioneer didn’t get there. Another great disc for demos is the soundtrack to The Thomas Crown Affair – it moves from latin to jazz, to piano and R&B. Once again the NAD impressed with its clear presentation. The Pioneer fell down a bit once again. One place where the Pioneer did outshine was in its warmth of presentation. Especially with female vocals, the Pioneer gives a beautiful voicing that sounds honest and warm. The NAD in comparison sounded thin. But perhaps that thinness was actually honesty – I don’t discount that I’m used to the Pioneer’s artificially-warm voicing and could be compensating. 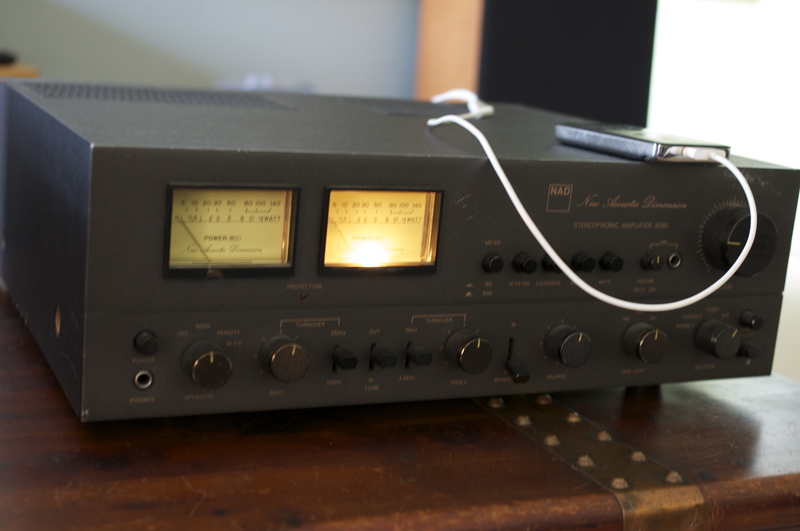 In any case, when comparing apples to apples, the result was clear – the NAD was a better performer. The treble was where I wanted it, detail was higher, imaging keener, bass better defined. My beautiful Pioneer had been beat. So the 7100’s now in its place and the Pioneer is in storage (sniff). First, a good subwoofer adds a lot. The B&W, even with the crossover turned down to 20hz (where I thought it would be effectively turned off) adds amazing depth to music. It moves air at the right times and gives fullness. Properly dialed in with the speakers it enhances them to such a degree that the entire system cannot be compared to those same speakers sans sub – there is no comparison. A good sub is audio umami. Second, my beautiful Pioneer is out of the rotation. It looks amazing. It glows. It’s tactile. It’s the inspiration for this blog. 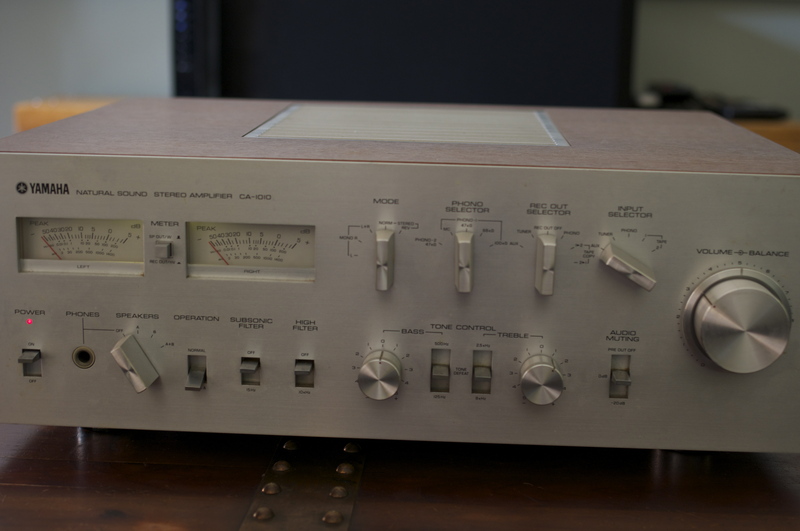 But even with every capacitor replaced and with some modern updates and solutions, it came in second to the NAD. At least for me. It’s still a beautiful and accurate system, better than a vast vast majority of what’s out there. As for a vintage item, it’s one of the best I’ve heard. Everyone should enjoy one at some time. And the golden voice is enchanting – once you’ve heard it you don’t want to give it up. If another person other than me had run this comparison I think that the Pioneer could have easily won hands-down. It’s that good and for a large part these tests are wholly subjective.